“The discussions focused on the security situation in the DRC, security sector reform, the rapprochement between the DRC and Rwanda, as well as the next phase of the mandate of the UN mission in that country,” Marie Okabe told reporters in New York. In a separate meeting with DRC parliamentarians, the Council members discussed human rights, the need to strengthen state authority in all parts of the country and the internal political process, including electoral rules, she added. On Monday the 15-member group visited Kiwanja camp near Goma, in North Kivu province, temporary home to some 13,000 internally displaced persons (IDPs) who have fled conflicts in the area, and was briefed by the military leadership of the UN peacekeeping mission in the DRC (MONUC) about the UN-backed operations by the Congolese army to address the problem of foreign and local illegal armed groups. The delegation is now in Liberia where it has scheduled meetings with President Ellen Johnson Sirleaf, senior UN officials, and members of the Liberian Truth and Reconciliation Commission. The group also plans to visit peacekeepers serving with the UN Mission in Liberia (UNMIL) and inspect several UN project sites. The team, which left New York on 14 May, also made stops in Ethiopia and Rwanda. 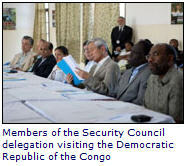 A similar Security Council mission visited Djibouti, Sudan, Chad, DRC and Côte d’Ivoire last June.